Let’s be honest keeping your accounting records in order is boring! And trust us, you are not alone if you only get your accounting records organised when your accountant asks for them. To help, I’ve compiled a list of tips to make the mundane task that little bit easier and remain HMRC compliant. After all, messy books could leave you with an expensive accounting bill or mean you forget to claim for business expenses that you paid for personally! When you are self employed you must keep records of all your business income and business expenses for at least 5 years after the 31 January submission deadline of the relevant tax year. So if you submitted your tax return for 2016/2017 online by 31 January 2018 then you must keep your accounting records until at least the end of January 2023. Similar records should be kept in relation to any other areas of your personal income which you need to declare on your self assessment tax return. Although you do not need to include accounting records when you file your tax return, keeping them organised will make it easier to work out your business profits and make sure that you claim all the reliefs and allowances you are entitled to. In addition, you make need to present them to HMRC if a query or investigation happens into your tax return. The amount of accounting paperwork a business receives and needs to store can vary between businesses as well as finding the most suitable process to organise accounting records. 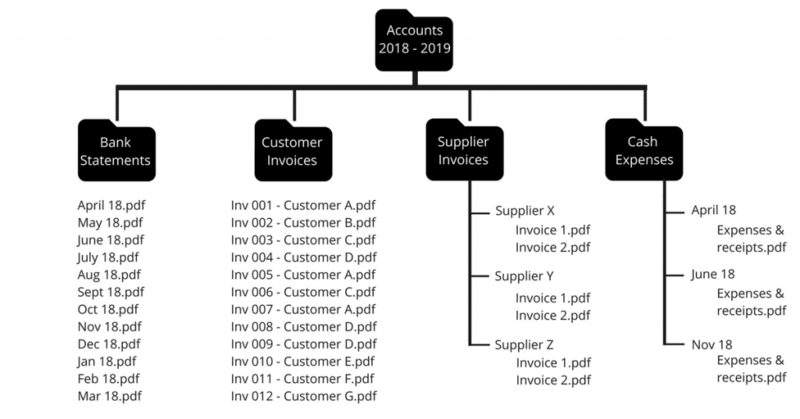 Here are some simple tricks to help you develop a robust record keeping system that will keep HMRC happy, as well as shortcutting and automating some of your admin work. In years gone HMRC required businesses to store hard copies of their paperwork, for the full 6 years bringing with it storage issues. Luckily, HMRC have moved with the times and soft copies of accounting records are now acceptable evidence of business income and expenses. This means you can store your accounting records on something like GoogleDrive or Dropbox. By creating an online folder structure you can save things like monthly bank statements and invoices on an ongoing basis, which is much easier than letter your paperwork pile up. For things like your cash expenses you can scan then in using a scanner such as this small Canon company scanner. Or The Google drive app has an option to take a photo within the app, which means your receipt is automatically snapped and saved in your google drive. There is no right and wrong way to set up your cloud file structure for saving your business paperwork online and you may need to do a little trial and error to find the right solution for you. If you don’t already have a business bank account, then consider opening one up (along with a deposit account so you can set aside your tax money on a regular basis). Whilst there is no legal requirement to open a business bank account when you are self employed, it is recommended by HMRC. Your business bank account will capture all your business income and expenses, making your bookkeeping so much easier to deal with. If you request a debit card to go with your business bank account, you can pay for your day to day expenses directly from your account avoiding the need to claim cash expenses (don’t forget – you still need to keep all your business receipts every time you use your debit card so you’ll need to scan them in and store them). If you don’t have a business bank account then you could use a personal credit card for all your business spending. That way all your spending is in one place, making it easy to pull together your information at tax time. Again, don’t forget to keep all your receipts and scan them in, along with the credit card statements, into your cloud storage each time you receive a statement. If you have a bookkeeper or VA you could consider asking them to help you stay on top of accounting admin, depending on whether you can trust them with confidential business information. You can find a routine that works such as: always handing them your receipts, asking them to analyse your credit card statement for your expense claim or have your accountant communicate with them directly what records need to be collated. Next articleHow Do I Apply for Self Employment?